I really like Isareth, regardless of her game text, because she reminds me a little of Morticia Addams or Lily Munster. Granted, there’s kind of a dramatic tonal difference, but I just thought I’d put that out there. Maybe it’ll be something for someone to think about – Magic could stand to be a little lighter in its non-silver-bordered sets. I’ve always been interested in reanimation spells attached to creatures, like Isareth here or the likes of Doomed Necromancer and Bladewing the Risen before her. On the one hand, they can be more fragile and, in Isareth’s case, less immediate than a Rise from the Grave effect. On the other hand, they are often reusable with any other reanimation spells, and can generate an advantage that basically snowballs. 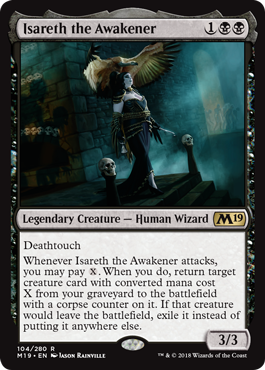 Isareth is a tempting version of that design because she has very efficient combat statistics, and because she scales to later stages of the game and can reanimate an Eldrazi in conjunction with Cabal Stronghold. I could see playing her in an aggressive black deck as an extra attacker with a bonus that might come up once your opponent starts slinging Cast Down. Also, am I the only one who wants to use those corpse counters as fuel for Giant Fan? Undeath becomes her, I suppose? Isareth is one in a long tradition of necromancers, and this one has a bit more repeatability than ones before it. As long as you have mana, Isareth can get your creature back by declaring an attack. It’s a one-shot revive, as the creature leaving play means it leaves play for good, but Isareth can slowly build up an undead army that your team can abuse. (Also, removing the corpse counter does not remove the exile rider; think of the counter as a reminder of its impermanence). She’s also only three mana, and that cheapness is a rather large boon for a creature who wants to come online quickly. And, thankfully for a creature that wants to attack, Isareth has means to deter blocks that would put an end to her necromantic misadventures in the form of deathtouch. She’s only a 3/3, which isn’t particularly amazing, but blocking her is a bit more of a daunting prospect without first strike to skew things, and I can see Isareth doing work in black decks. Probably not a Constructed card, but not all cards are.